When you decide to let your hair grow gray it's a big deal! The deliberate act of going gray brings us up close and personal with society's attitudes towards aging, attractiveness not to mention our own self esteem. It can even have us considering its impact on our career. 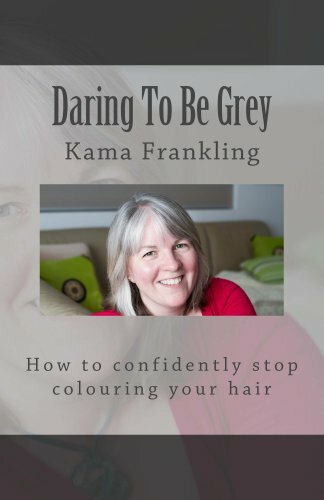 Let's face it, taking the silver plunge is a step into some seriously unknown territory and for all these reasons rocking gray hair is a decision worthy of some due diligence. The more information you have at the start, the better your resolve will be to see it through when things get bumpy. So what are the reasons for going against the grain and giving up hair color? For some, it's a health choice because of allergic reactions and sensitivities to dye. Others get tired of the constant battle to not only cover up gray roots but forking out big bucks to do so. And then, there are some who want to embrace their natural color. In all honesty, there's never been a better time to go gray. The Internet has changed everything with whole communities of like-minded women sharing tips and busting myths with blogs, pictures and videos. The online world has turned the idea of growing gray from something you just didn't dare do, into an empowering social movement (that also happens to be a fashion statement). There's still a ways to go but you don't have to look far to feel the tide changing. I decided to stop coloring my hair in August 2013. It was something that I'd thought about for a long time. While there are so many women who've had to stop because of allergies to dye, I actually thought that silver hair was a stunning look if it was done right. I couldn't take my eyes off women who had "it all going on" - but also had gray hair. I thought they exuded beauty and bravery. While I knew this would be something I wanted to try in the future, a couple months after my 51st birthday, I realized that the time had arrived. I was healthy and confident. My husband and kids were all for it. And that was that. The journey began and along the way, I've learned a few key things that might help ease your own gray hair adventure. When I first told my hairdresser that I wanted to grow my hair out gray, he was furious. It didn't matter that I came armed with an iPad full of pictures of silver haired role models or that it was something I really wanted to do. He was certain I was flirting with disaster. As he trimmed my hair while glaring at me, I decided (1) to fire him and (2) that I might have to get used to people not agreeing with what I was doing. To this day, I have friends who like to tell me that they're not sure about what I'm doing and that they'd never do it. Many women have shared with me that their families are not for it at all. For some, this lack of support is enough to pull the pin on the whole idea. For those of us who dare though - this is an awesome lesson in trusting our decisions, especially during fragile or insecure times. My confidence in what I'm doing, is actually inspiring to the same friends who doubt the whole thing. That alone is attractive. If you're willing to face the judgement of others with gray hair, it will spill off into other areas of your life. What would you do to improve your life if you didn't feel judged by others? The idea that I'd have to front up to a job or a big occasion like a wedding or party with gray roots was enough for me to postpone growing gray for a "better time". The thing is, there's never going to be a better time because there are always occasions we have to attend. I found that these "occasions" where I have to show up with my hair in transition are perfect opportunities for me to actually be my real self. For example, when I went to a recent wedding, I focused on what was most important and that was love and supporting my family. I had the best time, even though my hair had some two toned gray and dyed business going on! There will be many times where you get a feeling that doing the gray thing is a mistake and if you know this ahead of time, you can be prepared with a coping strategy. Fortunately, this is where the Internet shines. Online groups like Cafe Gray and Going Gray Looking Great Facebook page offer piles of support when you're having a meltdown. I also do regular updates and pep talks about everything I experience on my gray hair transition on YouTube. Wobbly moments are fantastic teachers because they actually pass if you can practice patience. How many other times in our life do we give up on ourselves because we don't see instant results? Experiencing these challenging feelings and getting to the other side show you the value of backing yourself, even when the going gets tough. If you are allergic to hair dye but are still suffering through to keep gray away, this book is for you. I love it! Great article. You are doing exactly the same as I have been for the last year or so, I am pretty grey and my hair is a lighter tone than its ever had been in my life. That necessitates thinking about complementary clothes colors a bit more. I am only 43, we go grey early in our family! My mum never dyed hers, so I had a pretty good idea what I'd look like. I was a dentist for 12 years and went fairly grey underneath all that hair dye and highlights. And don't miss all the time sitting in a hairdressers on my days off! Once I started working from home, it did make the decision easier to let it go. This was not because I did go out to work each day, but because it coincided with the realization of the complete freedom we really have to do what we want, and not worry about what others think, at all! I am going to dye my hair forever! My Nana was in her 80's when she decided to go all gray and it was beautiful. My mom is in her 70's and still uses Miss Clairol. I dye my own hair and do not mind it, but I certainly respect another person's choice. I'd love it if my gray hairs would grow out straight. I don't have a lot of them, but they are wirey - so I pluck them out with tweezers. I'd love to look like Emmylou Harris someday (her gray hair is gorgeous). Perhaps I'll try to grow it out when there is more of it coming in. Thumbs up and pinning. I always dyed my hair but hated the white roots. One day I went to the hairdresser. She stripped the color and dyed it "smoke" which means grey. It was an adjustment, but I've never dyed my hair since. I knew I would not be able to resist the temptation of the dye section while I was growing it out. Great article, This is something I debated on for years. When working I had to keep up with the coloring. Once I stopped, I hesitated. My hair kept falling out and I hated the regrowth showing all the times. So last year I had it chopped short while traveling so could wear a hat some of the time. I just wish that I had done it ten years before. My hair is so much more healthy now and has a decent shine too. Rated up. Great article! I found my first white hair a few months ago and I have been considering letting everything go natural. What a freedom from the normal upkeep!